JewelsObsession.com carries a large variety of gold Plumeria earrings. 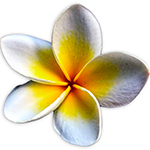 Browse our selection of gold Plumeria and floral earrings for sale. Plumeria flowers are native to Central America, Mexico, the Caribbean, and South America, but have spread across the world's tropics. Plumeria are most fragrant at night. In local folk beliefs they provide shelter from ghosts and demons. 14k 2 Tone Plumeria Post Earrings. 14k 2 Toned Plumeria Post Earrings.